This Steamboat rental home is located on the mountain extremely close to the Thunderhead Express lift. With the finest amenities and unique flexible bed configurations, Brown Bear Chalet can accommodate 12 guests in style.This chalet is just a few yards from the Routt National Forest boundary offering privacy and value close to the ski slopes and forest wilderness. 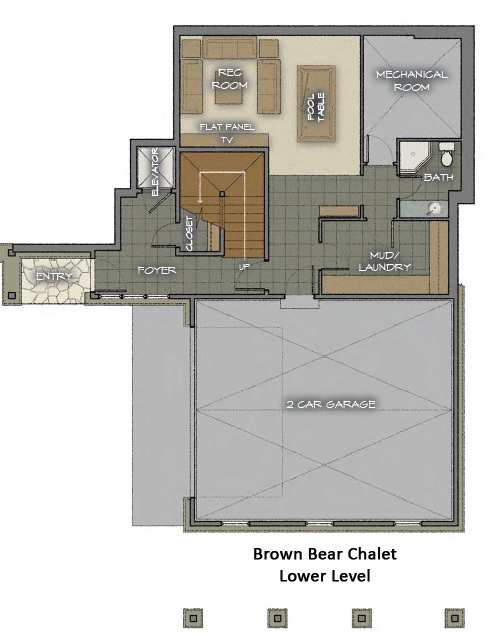 Brown Bear Chalet offers a spacious great room with covered deck and mountain views. Leather sofas invite you to relax in front of the large fireplace and 45" plasma TV. The large open floor plan kitchen is fully equipped and includes the finest appliances from Wolf and Sub-Zero. The rich tones of the custom alder cabinets and granite counters will inspire the creativity of any chef. The fine craftsmanship of the interior woodwork is complimented by the adjoining dining area featuring a hand-crafted 10-person alder dining table. The chalet offers 4 spacious bedrooms, each one with en-suite bathroom. 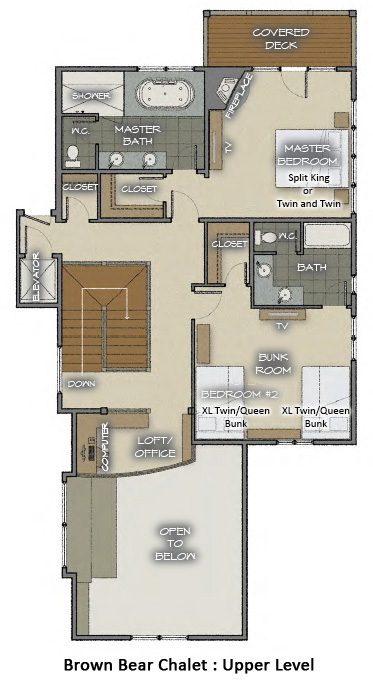 The Master bedroom and Bunk room occupy the upper level, and the Guest Master and Junior Master bedroom make up the main level. The rec room on the lower level combines as a media and games room with a 50" big screen TV with surround sound, Sony PS2 video games and a pool table. The separate mudroom includes a boot dryer and storage cupboards for all your ski equipment. The chalet is equipped with an elevator serving all floors. Ski access is a breeze at the Bear Chalets as private shuttle service will bring you to the Thunderhead Express Chairlift in just one minute.